It's no surprise that BMWblog.com was the first to post these photos. 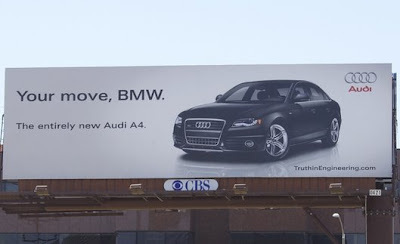 As BMW "one-upped" Audi in a Santa Monica, California billboard war. A marketing chess game ensued on the corner of Santa Monica Blvd. and Beverly Glen Blvd when Audi raised a taunting billboard featuring the new A4 saying "Your move BMW." 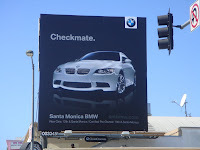 BMW of Santa Monica clearly took the challenge with their comeback of "checkmate." The only problem here is that the BMW billboard features a new M3 rather than a more comparable 3-series. Perhaps Audi has an S4 billboard in the works... Rematch anyone?